It's going to be a big weekend of hanging out at a fabulous resort, eating and drinking really good stuff (and lots of it) and trying to spot the occasional celebrity. (I saw Martin Short there once). [caption id="attachment_124" align="aligncenter" caption="Deerhurst Resort in Muskoka"] [/caption] The executive chef at Deerhurst Resort, Chef Rory Golden, has cooked up Thrill Of The Grill, a new celebrity event to promote the resort and some of the best products from Muskoka and Ontario farmers, wineries and breweries. This weekend, July 3-5, 2009, the Muskoka Food & Drink Festival at Deerhurst will be featuring Food Network Canada Chef Rob Rainford. It's all part of a package (details below) which will cost you and a friend about $800 for the weekend, but, for the price of a donation to the Ontario Association of Food Banks, everyone is invited to the Gourmet Griller Marketplace on Sunday afternoon, July 5, from 11:00 to 3:00pm. This will include at least one workshop, likely all about ribs, with barbecue champ Danielle "Diva Q" Dimovski. [caption id="attachment_125" align="aligncenter" caption="Chef Rory Golden from Deerhurst Resort"] [/caption] Thrill of the Grill is a new package at Deerhurst, and the most extensive in a series of seasonal gourmet getaway weekends. In addition to accommodation it includes a casual Friday reception featuring sampling stations with chef Brian Morin from Toronto's Beer Bistro and Big Rock beer, Saturday breakfast, admission to the Saturday afternoon Gourmet Griller Marketplace with vendors’ sampling, Saturday night’s dinner/wine pairing event with Rob Rainford, and silent auction, followed by access to a post-dinner campfire, and Deerhurst's famously lavish Sunday brunch. Rate: Two night package, from $399 per night, based on two adults. 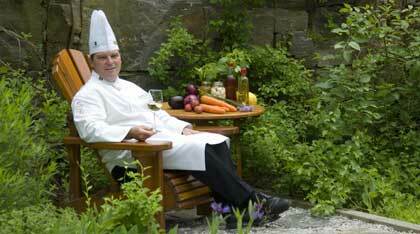 Check out the Ontario Culinary Tourism Alliance for info on this and other foodie events.